Bhutan Joins the Biodiversity Finance (BIOFIN) Initiative With Sustainable Development Goal (SDG) 15 on ‘Life on Land’ as a Royal Government priority, BIOFIN project kicks off in the world’s only ‘carbon-negative’ nation. Bhutan joins 29 countries worldwide to pioneer a new financing approach for biodiversity conservation, with the support of the European Commission and the Governments of Germany, Switzerland, Norway and Flanders. Each nation is set to leverage resources for biodiversity conservation through long-term financial solutions, forging relationships between national biodiversity stakeholders and global conservation partners. Through the BIOFIN initiative, Bhutan will define its current investment in biodiversity conservation and climate change; identify its financial needs and gaps through national assessments; identify resource mobilization challenges and opportunities including potential revenue streams; and expand the traditional boundaries of development finance to consider private sector, local fund providers, and other partners, in line with the blended finance vision of Agenda 2030. The aim is to build an evidence-based investment case to attract investors to partake in the nation’s unique conservation journey, and in doing so support the achievement of SDG 15 on Life on Land, along with SDG 13 on Climate Action, and SDG 1 on poverty eradication. Bhutan is a global leader in environmental conservation, with a constitutional mandate for at least 60 percent of the country to remain under forest cover in perpetuity. Today, its forests have the capacity to sequester 6.3 million tons of carbon dioxide—four times more than what it emits—making it the only carbon negative country in the world. Coupled with a healthy forest cover, Bhutan’s sound watershed management has the potential to produce about 20,000 Megawatts (MW) of clean electricity. 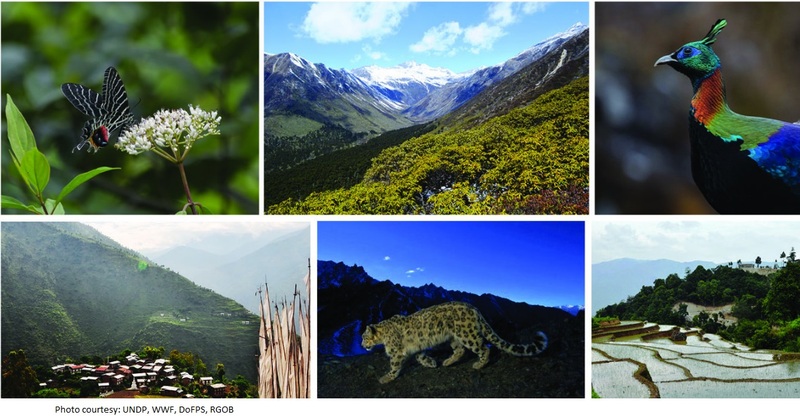 A recent study has valued Bhutan’s total ecosystem services at around US$ 15.5 billion per year. It is in Bhutan’s interest to uphold and advance its global reputation as a conservation leader through the BIOFIN and other such initiatives. These mechanisms will provide critical support to poverty reduction efforts in the country, as biodiversity is the natural capital of the poor. But sustained investment is required. Today, despite its carbon negative status, Bhutan has one of the highest per capita consumption of fuel wood in the world at almost 1.3 tonnes per person. Sixty-nine percent of the population relies on climate-sensitive agriculture. Economic growth is driven mainly by hydropower, a sector highly vulnerable to climate change and with the potential to irreversibly damage the country’s biodiversity and ecosystems if not pursued sustainably.